The Singer family’s behind many philanthropic efforts in the Manchester area. 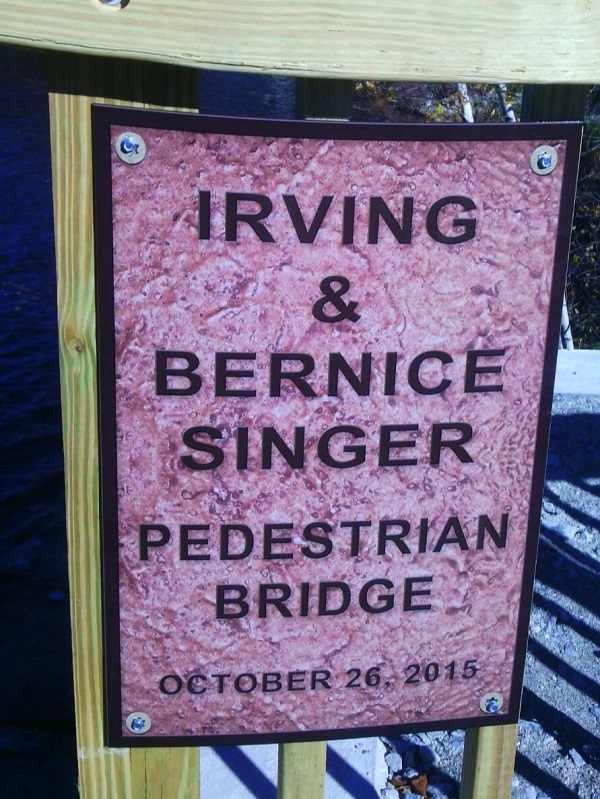 It’s fitting that the bridge carry the Singer name. 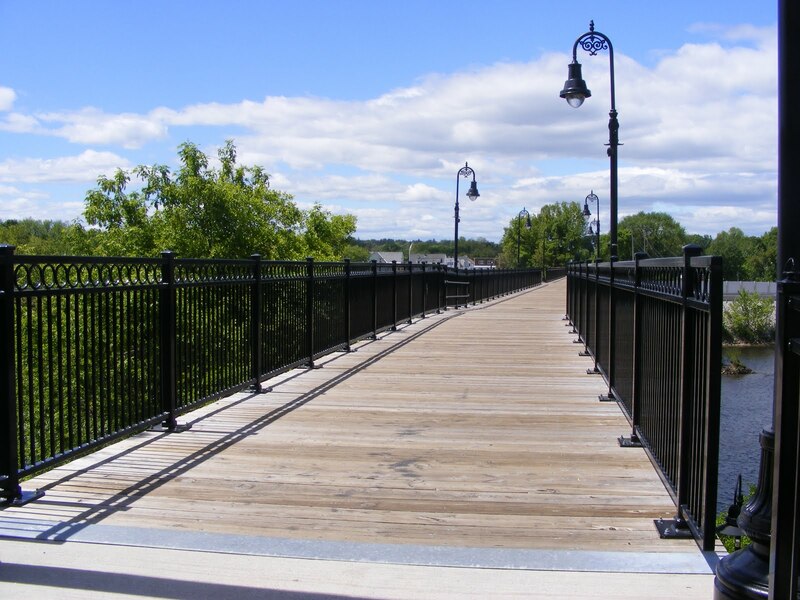 New Hampshire’s Piscataquog Rail Trail finally reaches across the Piscataquog River, connecting Manchester with Goffstown. I put off some workday tasks long enough to walk the trail from its east end all the way across the new bridge. With all due respect and gratitude to the many people who made the project happen (Manchester Moves and the Singer family, for starters), I didn’t stay for the ribbon-cutting and speechifyin’. Trails are for walking. On the Manchester side, looking toward Goffstown, at long last. I call this right neighborly. It was a good morning to walk along the trail all the way to the Merrimack River flowing past Manchester’s millyard. It’s mid-autumn and the foliage might be considered past peak, but it’s still beautiful as far as I’m concerned. Second Street bridge, near east end of Piscataquog Rail Trail. The Queen City: Manchester, New Hampshire. 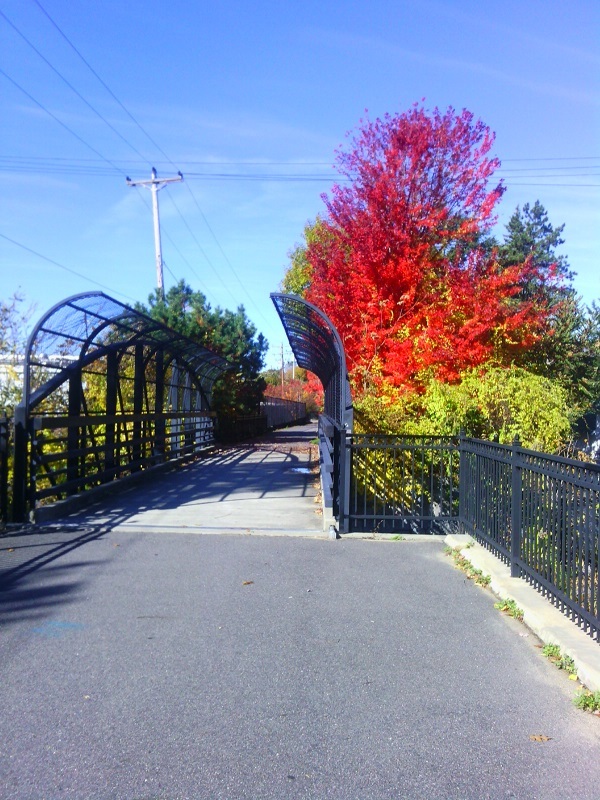 August 2015: new span will soon link the Goffstown and Piscataquog (Manchester NH) rail trails. Ellen Kolb photo. I take back every pessimistic word I ever wrote about the difficulties that would have to be overcome in order to link the rail trails in Goffstown and Manchester, New Hampshire. The previous post on this blog, from one month ago, showed a great big empty spot where the old railroad trestle over the Piscataquog River used to be. Now, sooner than I thought possible, a new bridge for pedestrians and bicyclists is in place. It’s not yet open, but I checked out the area today and saw a serious construction effort underway on the approach to the Manchester end. Nice to see that the proposed rail trail link connecting Goffstown and Manchester is moving forward. My afternoon walk on Manchester’s west side included a stop at the end of Bremer Street to see how construction is going. The old rail trestle is gone, moving us closer to the day when we’ll have a bridge for pedestrians and bicyclists to cross the Piscataquog River. In the meantime, the Piscataquog trail on the Manchester side is in fine summer form, with plenty of shade. July 2015: the fence is gone, and this will someday be the approach to a river crossing for pedestrians and bicyclists. July 2015: work is evident on the Goffstown side of the crossing, too. 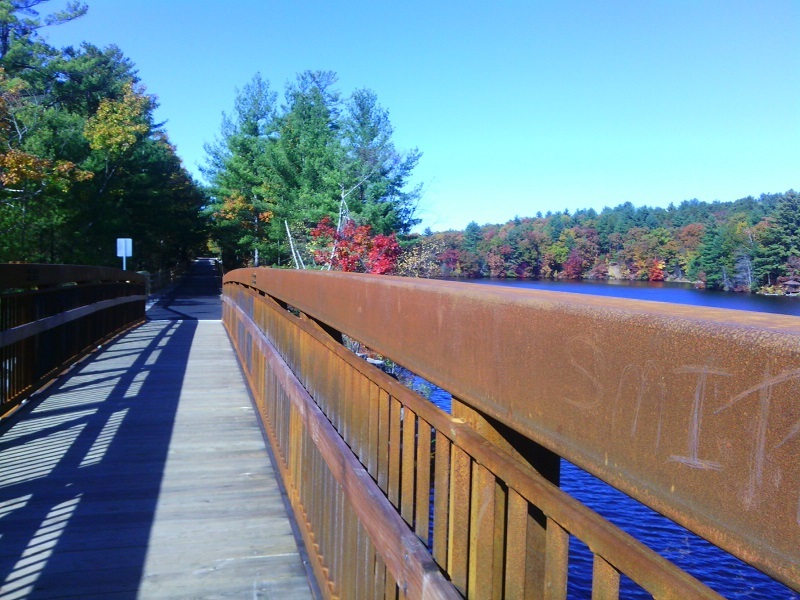 New Hampshire’s Heritage Trail is actually a jumble of disconnected paths, many of them near the Merrimack River. I like Manchester’s segment through the Millyard along the Merrimack River. 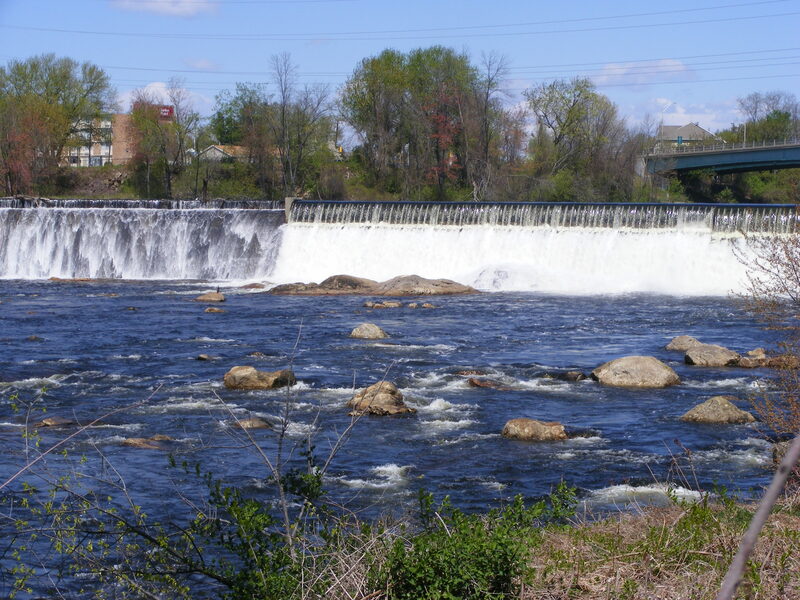 This overlook near the Amoskeag Dam is a fine spot for a brown-bag lunch. Sure, there are restaurants nearby, but for some days, only a view like this will do. So how can I do a better job on my next visit of making my camera capture what my eye sees? 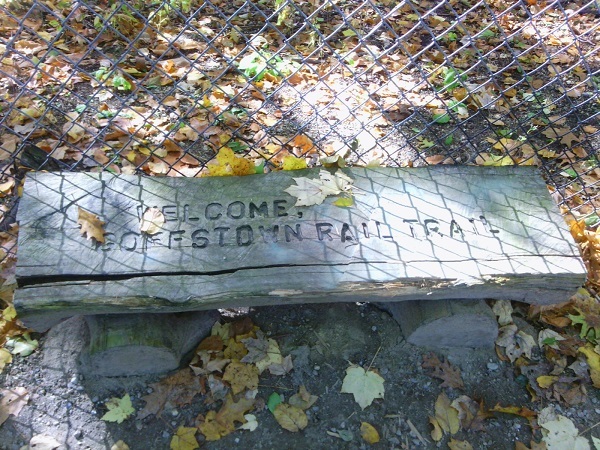 I welcome your comments, as well as your reports of your own favorite Heritage Trail spots. 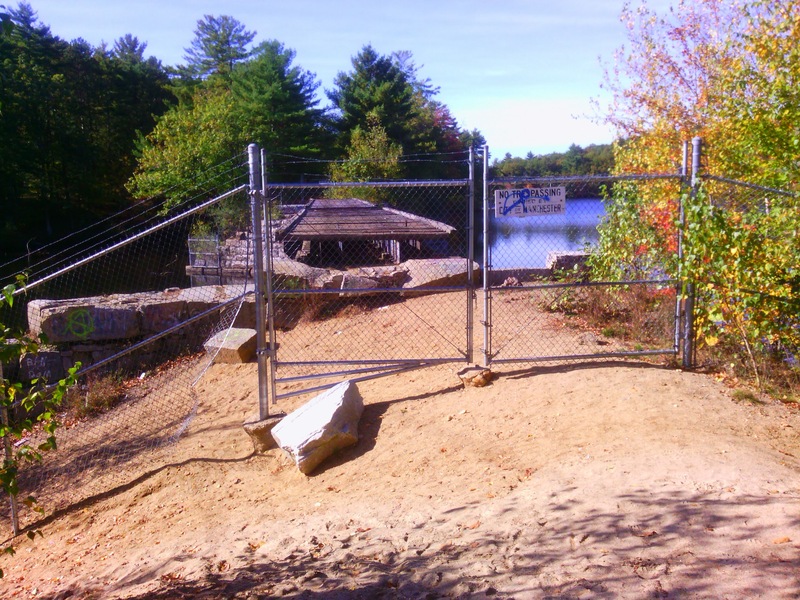 I reported last April on plans to build a pedestrian bridge over the Piscataquog River to link rail trails in Manchester and Goffstown. How’s that going? Alas, very slowly, it appears. The old trestle is still in place, still fenced off, with no new bridge next to it. I know these things take time. Here’s hoping that all the factors come together soon. 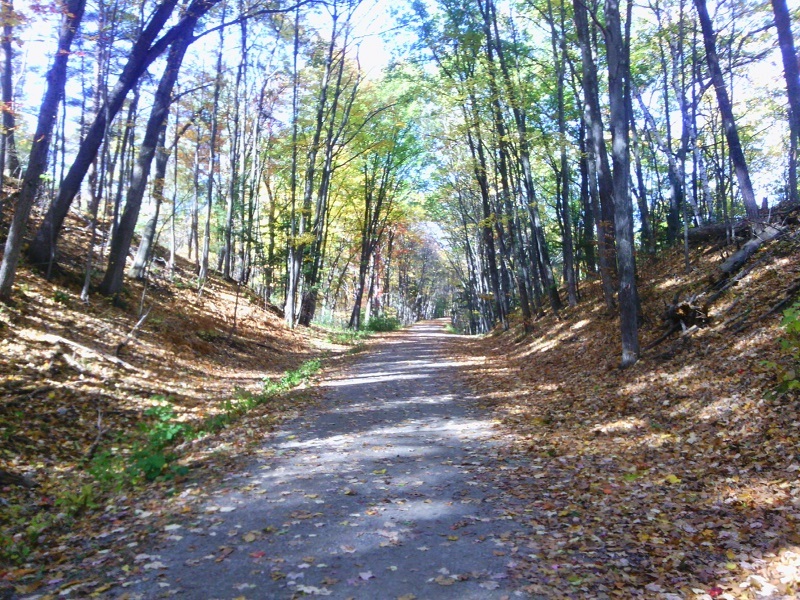 I couldn’t visit Manchester’s side of the trail on a fall afternoon without spending a half hour on it. My last visit to this segment was three years ago. I took these photos today to show how the leaves aren’t at peak color yet in this area. 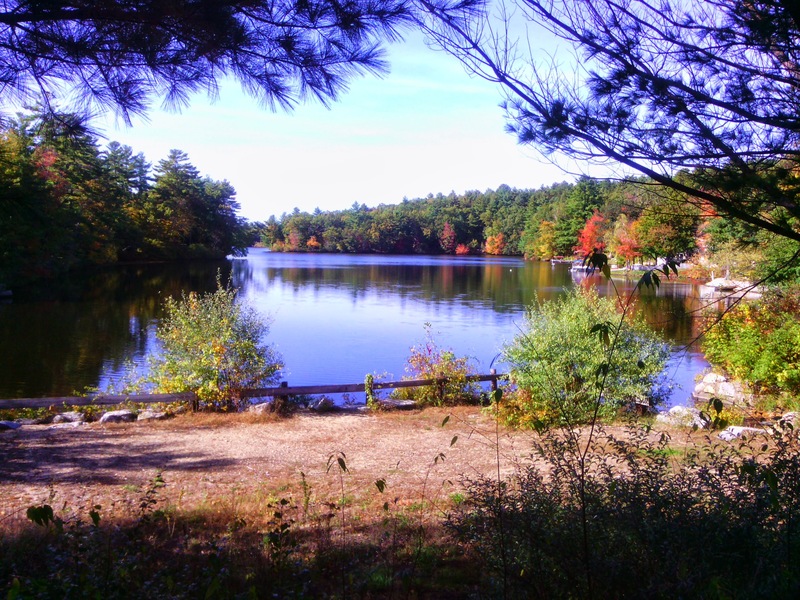 I should have another couple of weekends for leaf-peeping. This will be a pedestrian crossing, someday. 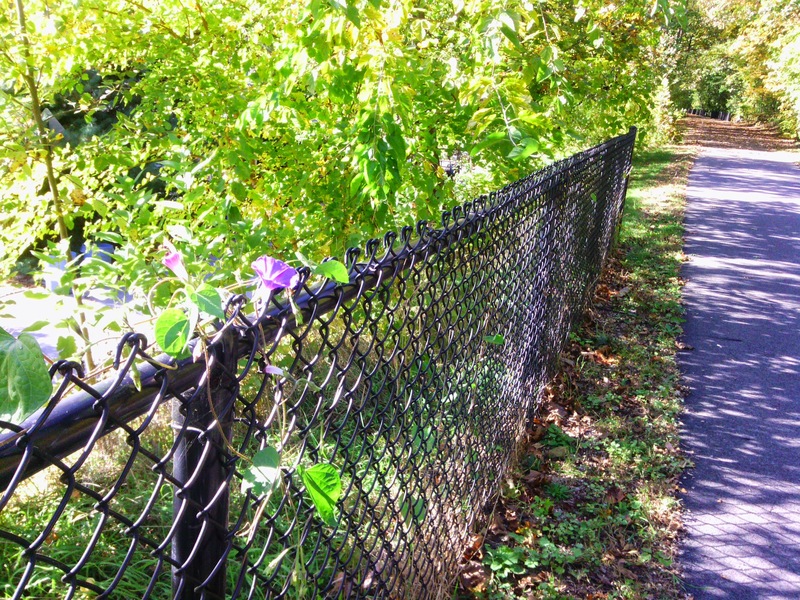 Fences between the trail and private yards are softened by blossoms like this. Note the lack of fall color. The best is yet to come. It took a whole lot of people, headed by Helen Closson, to make a pedestrian bridge out of the abandoned rail bridge across the Merrimack River in Manchester, NH. Closson called the project “Hands Across the Merrimack” while it was underway, and whatever name the pedestrian bridge may be given officially, that’s the name I’ll remember. 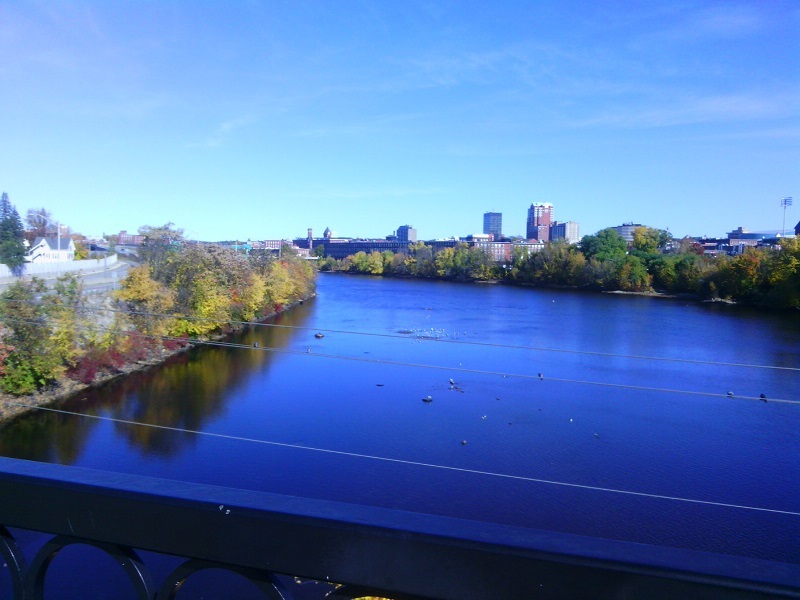 I’ve been on the bridge before, just for the fun of crossing over the Merrimack on foot. Today, after some business in town, I took advantage of the sunny afternoon to walk the rail trail clear across Manchester’s West Side. This is Manchester we’re talking about, so “clear across” means about two miles. Starting from the baseball stadium where the Fisher Cats play on the river’s east side, a paved walkway runs parallel to the Merrimack and shortly comes to a fork. Going right would have brought me under the rail trail and onto some private property. Going left brought me around a sweeping curve to the approach of the Hands Across the Merrimack bridge. I was a bit startled to find a sculpture of a steer just short of the bridge. The plaque mounted nearby noted that the statue was a tribute to workers & entrepreneurs like the ones from the former JacPac meat processing plant located nearby, now the site of a hospital expansion. Vandalism has become an issue along the trail, judging from some news reports I’ve read. It looked good today, though. I’m sure that’s an ongoing effort by people who care. The trail is paved its entire length, and the pavement’s in good shape. 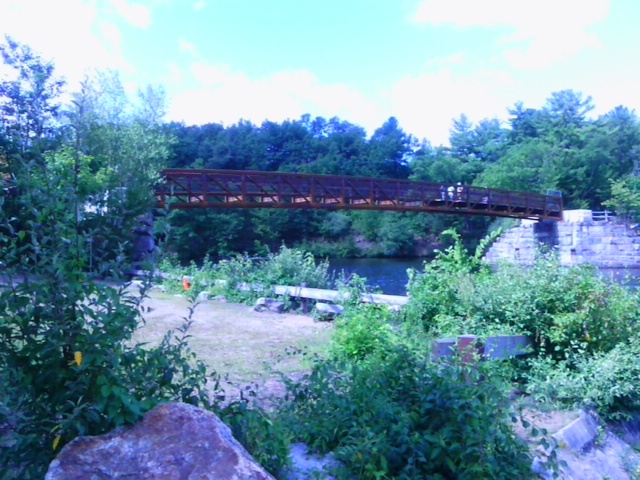 The bridge is at the southeast end of a trail that parallels the Piscataquog River. For now, the northwest end of the trail is near what I call the Kelley Street bridge (Nazaire Biron Bridge on my map) that links the West Side with the Pinardville neighborhood. There’s a very hazardous crosswalk on Main Street, but the few other road crossings are in quiet neighborhoods. The trail, like the rail line before it, goes on a bridge over Second Street, avoiding a road that’s just as busy as Main Street. The Piscataquog snuck up on me. I cleared Main Street & followed the trail behind a house where there was a cheerfully noisy party going on. As the music from the party faded behind me, I became conscious of the river’s sound, and there it was on my left. A few weeks ago, we had heavy rains, and this river was particularly pesky for the people living along it. Today, though, it was a tame & pretty thing. Several dirt trails ran steeply from the trail down to the river. I stayed on the pavement, worried that I’d twist an ankle trying to negotiate the slope in my sneakers. Other people had no problem. Eventually, I came to some ball fields, where a softball game was just wrapping up. Soon I was in sight of the ugly red bulk of West Side Arena. The building’s homely appearance belies its worth as an athletic facility for what seems like every kid on the West Side. Soon I passed under the Kelley Street Bridge and reached what is now the end of the trail. Once upon a time, this rail line crossed the Piscataquog near Kelley Street, and then paralleled the river (on its north side now) through Goffstown & into New Boston. Patches of the line have been developed into trails. I’ve been on one segment in New Boston near where the middle & south branches of the Piscataquog converge — a beautiful spot. In Goffstown, determined residents have turned part of the old railbed into a trail, and they continue to try to finish the link between New Boston & Manchester. For now, though, all I saw after crossing under Kelley Street was a fenced-off trestle hung with well-justified “Keep Off” signs. I suspect that tight municipal budgets and concerns about liability will keep that trestle from ever being turned into a pedestrian bridge. Of course, that’s what I used to think about the bridge across the Merrimack. This is not a path I would take after dark, except maybe for a stroll on the bridge after a Fisher Cats game. This is what passes in NH for a big city, with all the mischief that entails. A weekend afternoon in broad daylight, however, is another story. Today was fine.